Benue radio station, Wurukum Market, and seven communities have been submerged following Saturday night heavy downpour in Makurdi. 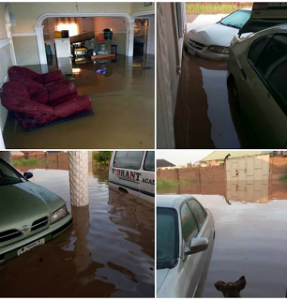 He said that the Transmission House of Radio Benue and Wurukum Market were submerged as a result of the downpour. Other communities affected were Welfare Quarters, Benue State University community, New Kanshio village, Rice Mill Wadata as well as Idye and Achusa villages. The commissioner said that the state has not received any ecological assistance from the federal government since 2013. “Benue Government is looking for ways in which River Benue can be dredged. This is because by dredging the river, majority of the water can be accommodated to prevent future overflow.